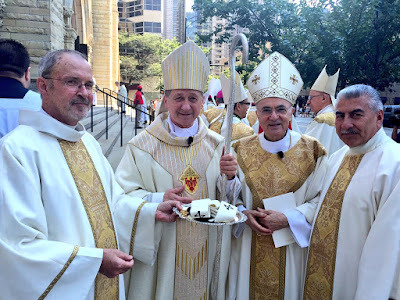 Just past 11 months since the news broke – and, with it, every possible reaction under the sun began to erupt – this Sunday afternoon in Chicago brings an unprecedented transition of Stateside Catholicism's third-largest outpost full circle as Archbishop Blase Cupich receives his Pallium in Holy Name Cathedral. Given the Pope's desire to return the rite to the local churches – announced last January as a sign of a re-amplified "synodality" in the universal church's governance – today's ceremony marks the first domestic conferral of the metropolitan's band since 1983, after which St John Paul II took the act to himself, placing the woolen symbol of "the fullness of the episcopal authority" on the world's new archbishops every year on the feast of Saints Peter and Paul during a concelebrated liturgy in St Peter's. While Francis continued the practice of celebrating this year's 29 June with the metropolitans named over the prior 12 months, the pontiff only gave each his pallium – only to be worn within his province – in private following the Mass, to be placed on them at home by their respective papal representative. Accordingly, the second US metropolitan named over the past year, Archbishop John Wester of Santa Fe, will be invested in early October – just after the feast of St Francis of Assisi – in his New Mexico cathedral dedicated to the Poverello. All that said, below is Quigley Chancery's livefeed on-demand video of the Mass... with, of course, its worship aid... homily, etc. to come. My heartfelt welcome to you all – young and old, interreligious leaders, elected officials, parishioners, women and men religious and priests from around the archdiocese, and friends and members of my own family who have travelled far. You presence today is very encouraging to me. In particular I want to tell my brother bishops from Illinois and the region how grateful I am for your support by joining us today. Thank you. Marc Chagall’s famous painting, The Praying Jew, depicts a man, wrapped in a prayer shawl with phylacteries, ribbons imbedded with passages of the Torah from the Old Testament. They are banded around his head, reaching to the elbow and the hand. The point is simple – the one who prays is to sit with the Word of God that it may ever be in his mind, his heart and his actions. A garment rich in meaning, this prayer vestment provokes deep reflection. So too does the pallium. Made of lamb’s wool, marked with crosses and stained at the ends in black to resemble hoofs of the sheep, it is placed on the shoulders reminding the one who wears it and the entire church he serves that we are a community that goes after the lost sheep. Not only those who have strayed, but those who are ignored, forgotten or overlooked. The task is not just to find them and bring them home, but to lift them up high, to shoulder level, where they can begin to see and live a new life, the life of faith. While there are no scripture texts imbedded in the pallium, we have the happy coincidence that the scripture readings for today are so apt, with a Gospel that features Peter, in union with the other 11 Apostles, leading the Church in making the act of faith in Christ, the Holy One of God. All of this invites us, then, to sit with the Word God and reflect on what is being asked of us, as the successor of Peter through his representative places the pallium on my shoulders as the pastor of the Church of this City of Big Shoulders. And, I do mean us, for I know I cannot carry this important responsibility by myself. Every successor of St. Peter, and now Pope Francis, offers a similar service of memory for the Church. Traditionally, in union with the college of bishops, the Pope has acted as the guarantor of the Church’s deposit of faith, preserving and being in touch with what has been handed on and developed over the ages. His service is needed lest we begin to treat the church’s tradition too narrowly and forget the history of our faith and the treasures we have. Recently, as I was visiting with some patrons of the Vatican Museum, I noted that the aim of the Museum is not to make the pope an art collector. Rather, it testifies to his role of preserving the heritage of how the beauty of creation and the Gospel has been expressed in each age. So, too, the pope guards the treasures of our faith so that nothing is lost, ever keeping before us the entire tradition, lest we end up absolutizing one particular era. Peter’s successor not only keeps safe the entire treasury, the entire deposit as it has developed over 2000 years, but he keeps it before us in its entirety, reminding us of the whole story of God’s mighty deeds, which continues to develop in each age with the guidance of the Holy Spirit. Saint Pope John XXIII offered this service of memory in his talk at the opening of the Second Vatican Council. He called the entire Church to a fresh appreciation of the ancient teaching of the medicine of mercy in an era when many in the Church preferred the narrow path of severity and condemnation. So, too, in his encyclical Laudato Si’, Pope Francis quoted generously from statements on the environment made by bishops’ conferences around the world and from the Ecumenical Patriarch Bartholomew. In doing so he put us in touch with the universality of the Church, reminding us that God is doing great things not only in every age, but in every place around the world today. It is the pope’s ministry that draws us out of a narrow provincial view that reduces our experience of Church to just what is happening in my parish, my diocese, my country. The pope’s travels around the world similarly offer this service. As we follow him on these visits to Asia, to Latin America, to Europe and soon to our own country and after that to Africa, he introduces us to our brothers and sisters in places we never visited, reminding us of what it means to be Catholic, a Church whose universality must be reflected in every particular Church. All of this has much to say to this local Church as he gives us a share in his unique ministry through the pallium. It occurs to me that the reading from Paul’s Letter to the Ephesians today is a good example of how the early Church experienced the newness brought about by the Risen Lord. Honestly, many preachers prefer to avoid this text, as it has a phrase that makes many squirm – especially men – as they hear the words, “wives be submissive to your husbands.” What is overlooked, however, is the opening sentence that husbands and wives are to be subordinate to each other. They each are to become lowly, poor for each other. People in this era of the early Church would have found this quite astonishing, if not revolutionary. Subordination in a family was not a two way street at that time. Christ was doing something utterly new in the human family, changing how people understand their relationships with each other as family. With the upcoming synod, it is clear that the Holy Father is calling the Church to examine our categories of expression about what we believe and be open to new avenues and creativity when it comes to accompanying families. All of this has much to say to us in Chicago, that we not settle for solutions that no longer work, expressions that no longer inspire and ways of working that stifle creativity and collaboration. 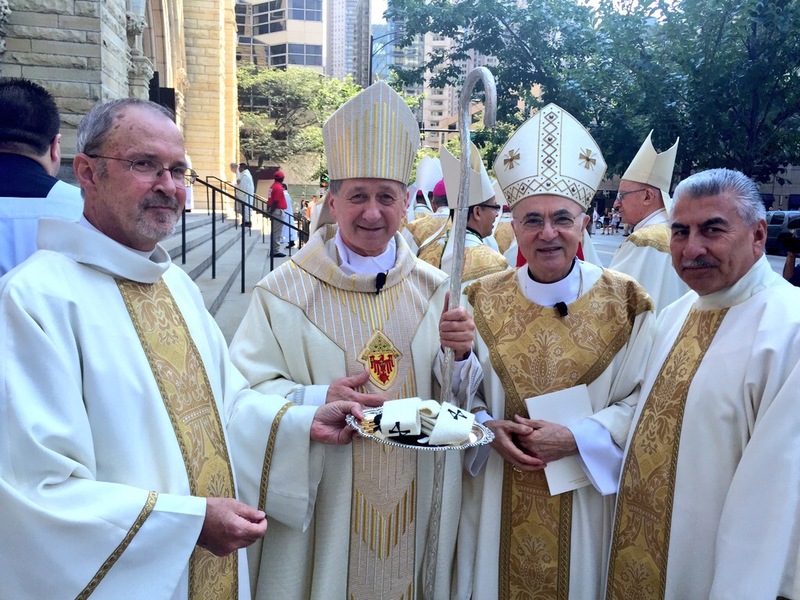 Peter’s unique ministry in the Church is a great gift, as is the pallium received today. Our commission begins with searching out the lost, but it does not end there. Once found, the lost are to be lifted high above the daily toil, so that they may see their salvation as but another of the mighty deeds of God over the ages, so that in being raised high they will experience the newness of risen life and by being lifted to eye level, they will see Christ face to face and come to believe in God’s love. When Chagall painted The Praying Jew in 1923, he asked a local street beggar to dress in his father’s clothes and serve as the model. The Lord likewise chose the beggar Peter, as his model, a man weak and sinful by his own admission and the Church’s. In fact, the earliest depictions of Peter in Christian art are of a man weeping, the repentant Peter. Just as Peter’s faith is a model for us, his poverty and lowliness is too, as we take up this share in his ministry. A great reminder to us, that while we are honored to join in this service and leadership, we do so as poor beggars, depending not on our accomplishments and strengths but on his grace and mercy. For, like St. Peter, we know the value of lifting up to shoulder level the lost, for we have been lost ourselves.